When we sought out to tell the stories of our city through The 77 Project, I was immediately taken by the mission of Chicago Run, which is to promote the health and wellness of Chicago children through innovative, engaging, and sustainable youth running programs. But what exactly does that mean? Read on. After an initial phone call, I sat down with the Chicago Run team in early September to talk through one of their new programs. After years of taking their programs into Chicago Public Schools, they were piloting a program with the Cook County Juvenile Temporary Detention Center (JTDC)—a juvenile temporary detention facility that provides secure housing for youth from ages 10 through 16 years, who are awaiting adjudication of their cases by the Juvenile Division of the Cook County Courts. When I heard this, I knew for certain that we had to tell this story. When I arrived at Chicago Run’s headquarters, I sat down with Lauren Shirk, Director of Communications and Events and Alex Landberg, Interim Executive Director. Landberg shared that Chicago Run was founded 10 years ago in direct response to a severe lack of physical fitness opportunities for Chicago Public School students. At the time, the average CPS student was engaging in approximately 60 minutes of physical activity on a weekly basis. They were initially focused on elementary school students. Now, their programming starts at the pre-k level and goes through high school—and most recently, they’ve explored opportunities outside of the school system. According to Landberg, the work at JTDC is phase one of what’s next for the organization. It was born out of a relationship with the center’s medical director, Dr. Ngozi Ezike. Each program is six weeks of training and culminates in a 3K race. 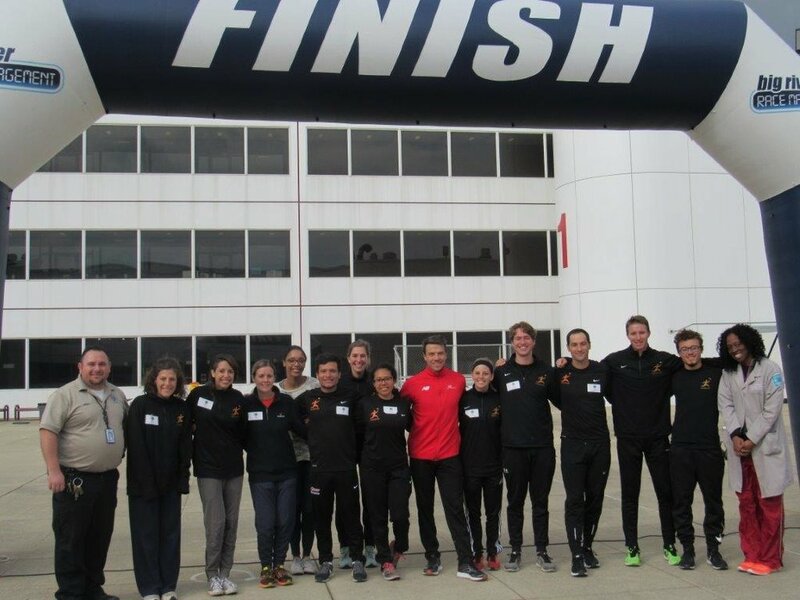 The spring’s pilot program was such a success that the Chicago Run team returned this fall for round two. Chicago Run team, Dr. Ezike and JTDC staff, and me peeking out from behind after a successful race day. On October 27, I joined the team at JTDC’s facilities for race day. The Chicago Run team arrived bright and early at 8am to set up. Admittedly, I did not know what to expect when I arrived. I was dressed in jeans and a sweater, but the Chicago Run team came to participate, armed with their best active wear and all the bells and whistles to make this day a success for the residents. When we got to the outdoor space, the team set up a formal finish line, a race clock, fueling stations with water and snacks, and had t-shirts and race bibs ready for the residents. The attention to detail was admirable, and I was eager for the residents to join us. Shortly after 9am, the residents began to arrive. We didn’t have a gauge for what the turnout would be, but were excited when we saw that—according to Dr. Ezike’s final headcount—18 of the youth participants showed up to run the race. It’s important to note that this program is optional, and the residents can opt in—or out—as they see fit. With a great crowd, we were off to a fantastic start. The race began before the 10 o’clock hour. With a DJ onsite (a resident of the facility with a real talent on the 1s and 2s) to keep energy up, the residents were off on their 10 laps around the perimeter of the space. As I stood with the Chicago Run team to cheer them on, I was impressed by their determination and resilience. The physical fitness levels varied, but the commitment did not waiver. As residents completed the race, they jumped right back in to pace and encourage their fellow participants. Every single resident finished the race, and you could feel the energy of accomplishment in the air. As we high-fived the participants, and asked them about their experience, it was clear that I had taken part in something really transformative. On race day, one of the residents was overheard saying, “this really hurts, but I’m not going to quit because then it means nothing. I don’t start stuff if I’m not going to finish, so I’m going to finish this race,” and she did just that. Dr. Ezike reported that in a recent poll, 90% of the residents reported an easier time sleeping after participating in the race. I watched participants as they lined up for photos, chatted with the Chicago Run team, and inquired about their race times. It was clear that they had gained something more than a restful sleep. Though I am certain they each had a personal experience that I could never convey, I feel confident in sharing that they exited that space more confident and secure than how they entered it—and honestly, so did I.
Chicago Run plans to return to the Center in the spring for another round of race training, and I’m already checking my schedule to see how I can volunteer. If you’d like to learn more about and contribute to their mission and/or explore ways to get involved, you can do so here. This blog post was originally published by Chicago Ideas as part of their storytelling series The 77 Project. Learn more about Chicago Ideas and The 77 Project at chicagoideas.com. The 77 Project is a storytelling and media project presented in partnership with Xfinity with additional support from Robert Wood Johnson Foundation to help redefine the narrative of our neighborhoods from the inside out.